Rock ‘n’ Read 2018: The Details! Get out and enjoy one last hurrah of Spring Break/SXSW 2018 on Saturday, March 17! 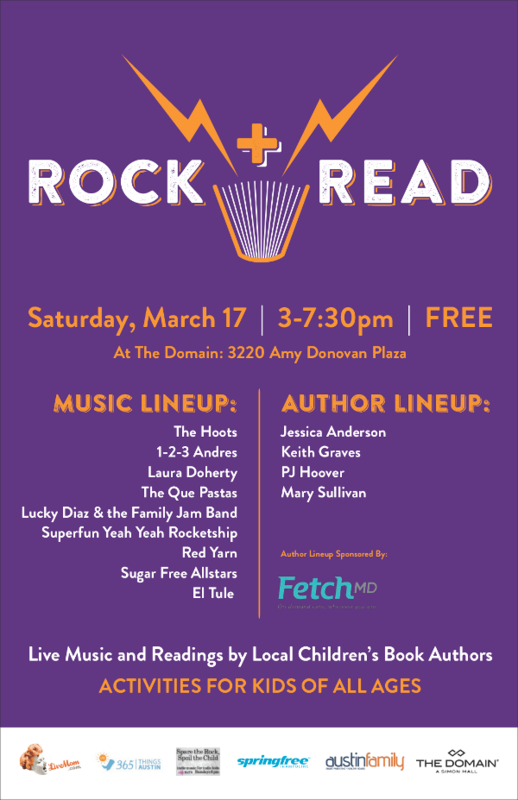 Rock + Read at The Domain is a live music and book fest where both kids and adults will enjoy a great lineup of musicians as well as local children’s book authors, who will be reading from their books in between music sets. There will also be hands-on activities for kids of all ages, books signings, giveaways and more at this FREE event! Thanks to our sponsors, The Domain, Springfree Trampoline, and Fetch MD for making this event possible. There’s this story, based on a survey of folks involved in kid literature. I don’t know what the results of a similar survey would be if done in family music, but I’m under no illusions: There’s no reason to think we’re immune from it. So here are some basic policies for any event I’m presenting on my own. They apply to presenters, attendees, sponsors, producers, crew, and me. And anyone else. I intend to include them in advance emails to performers and won’t book acts that won’t go along with them, and won’t put on events at venues that aren’t cool with them. My aim, and the aim of folks with whom I work, is to create fun, safe, silly events that are actively inclusive. These guidelines are consistent with what I’ve observed doing this for over a dozen years and are intended to be there to (a) hopefully avoid any future problems and (b) deal with the very rare problem case. This is a first draft and if there are improvements suggested, I’ll consider and adopt them. The structure is borrowed, with permission, from the JoCo Cruise Code of Conduct. Be kind. Treat others with kindness and respect. Be inclusive and friendly, like we try to get our kids to be. This underlies everything else. Be nice to our staff and volunteers. Number 1 up there applies to everyone working the event, too. Follow the law and follow the rules. Duh. And if I become aware of any conduct that might meet the definition of a hate crime, you better believe I’m reporting it. If an attendee is aware of any conduct that violates these policies, there will be identified people to whom they can make a report. To be clear: if you see something problematic, tell someone; that’s your responsibility as a person engaging in society if you can do so safely. The policies, and those contacts (who will when feasible include at least one person independent from the event) will be posted at events. You have my personal commitment that harassment won’t be tolerated and we’ll deal with problems promptly. Because I’m involved in a range of events with different partners and contexts, I can’t make a general statement here about precisely what the process will be in all situations, but I do mean “deal with” appropriately and thoroughly. If I learn of misconduct at an event I’m part of, I will share that knowledge to try to prevent future harm. For events/conferences I’m attending as a presenter or otherwise (as opposed to presenting), or events I’m helping produce without being a primary presenter, I’m borrowing ideas from John Scalzi’s policies: You need to have a harassment policy. It needs to be clear and it needs to have an enforcement mechanism. It doesn’t have to be the same as this one above, but it needs to be similarly broad in coverage and scope. Again, I’m not basing this on any specific knowledge of specific misconduct at any family music event I’ve attended. But the older I get, the more I realize I have an obligation to do what I can to make sure everyone feels comfortable and welcome and safe at events I put together. Like I said, this is a draft. I think it’s a pretty good one, but I’d love to know how it can be improved. You can comment below or email me (show at sparetherock dot com).